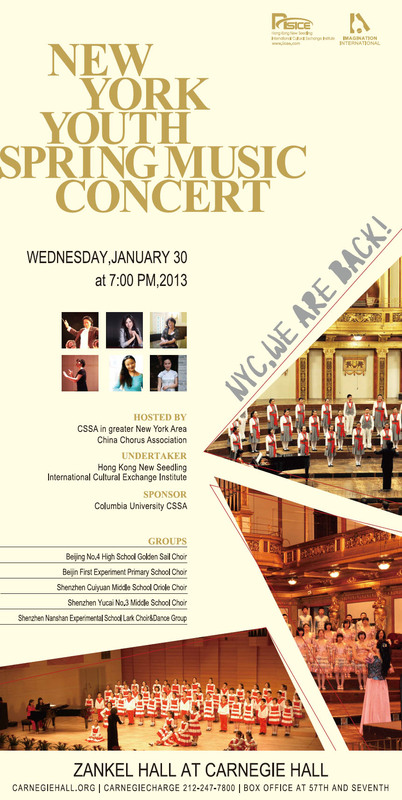 It is not the first time you see us, this January, Hong Kong New Seedling Cultural Exchange will cooperate withChina choruses association,present you the “Youth Spring Music Concert” at Carnegie Hall,which called”the song from heaven”! The young artists from china would love to celebrate the most important Festival-“Spring Festival”together with people in New York.share the way of their celebration,we believe that New Yorker will enjoy the traditional and modern music from china. And two local Choirs in New York to join the party! The activity gets the strongly support from China to halt New York general consulate and New York the Chinese people overseas Chinese represent and the commercial circles represents of , China halts general consulate consul in New York and the public the celebrity should invite attendance, western and essential medium in succession publicity, not only publicized Chinese nation literature magic power, return three play brought matchless honor and the highest popularity, carried out an activity to pass an on display citizen of art form the cultural art of clan special feature, strengthen the cultural interaction of international, promote the target that harmony in the world peaceably develops. 1 user commented in " New York Youth Spring Music Concert "
High I’m trying to become a member please place me on your mailing list.